Mari and I walked in the door 10pm, a little tipsy from the bottle of Norton enjoyed at the Melting Pot for my bday. As soon as we crack the door, there's an excited, "Mom! Mom! 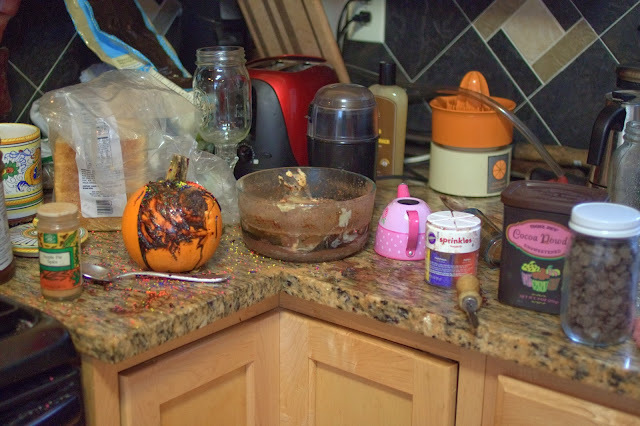 We're making pumpkin cookies!" 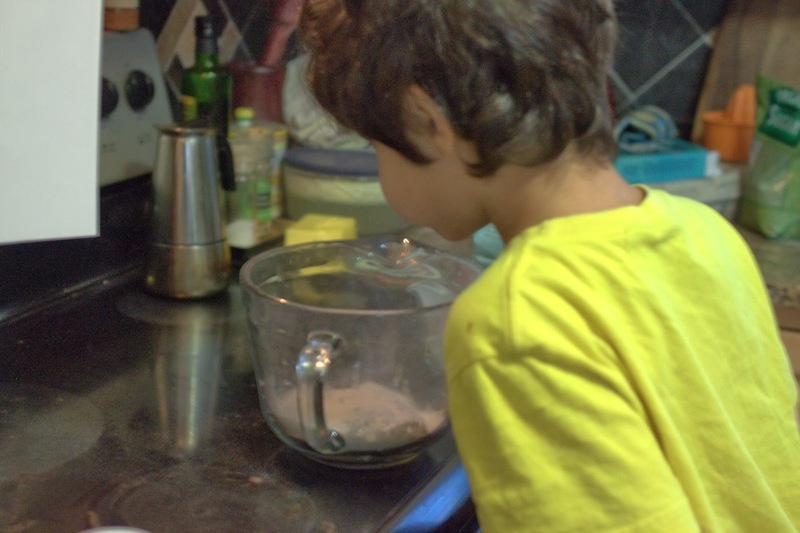 It's 10pm, and the kids are up making cookies. My mom huffs with frantic defeat, "They made a huge mess!" Tipsy me thought this was a great time for all and a successful experiment. "Guys! Wow, that's really cool!" They started naming off all the things they put in: bread, butter, sugar, chocolate powder, sprinkles, etc. I'm having a blast with their excited vibe, "You know what would help?" Nala pauses from sprinkling the pumpkin and looks up, "What?" 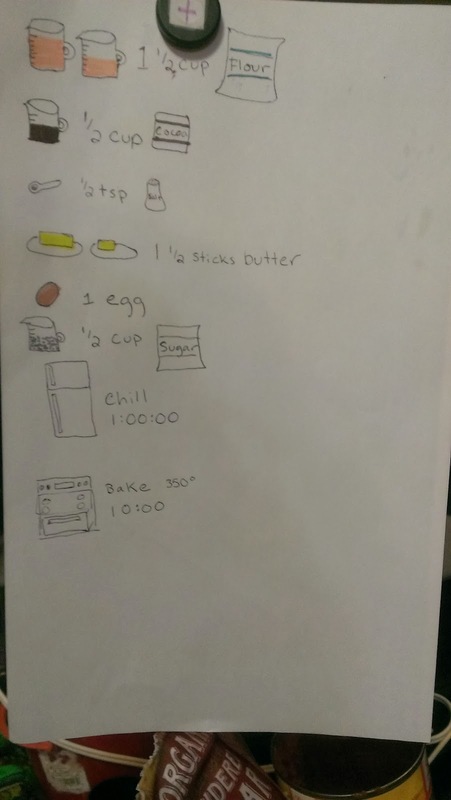 "A recipe." I respond. "How about if we make cookies together tomorrow and I'll find a recipe for us to use?" And we happily went off to bed. That was the beginning of the cookie talk. 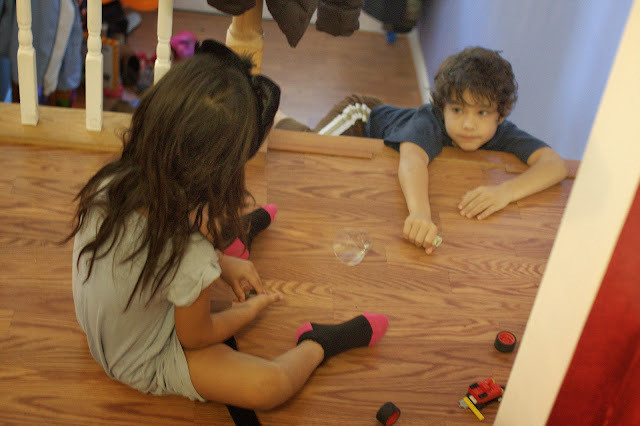 The following led to the most educational and exciting homeschooling experience we've had so far this year. With implications on so many different levels: math, science, chemistry, units, reading, writing, planning, business, sociology, commerce, government. 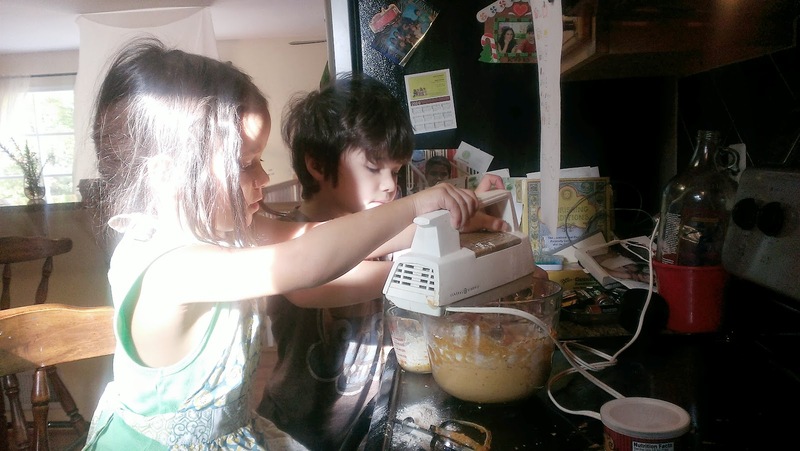 Once when I was doubting I'd have sufficient evidence of progress with our unschooling approach, a mom said, "You need to find someone with an educational degree to give you all the buzz words that put what you are doing into school speak." This activity was an example of that, exactly the type of interdisciplinary cross-subject learning that public schools are trying to move towards. Schools are hot to integrate subjects this term because it promotes deeper learning. For example, mixing science and math, or history and literature. That's the big curriculum push going on right now. Because in life, subjects are not isolated the way they are in school. Schools are trying to act more like life. Since we're not in school we have the luxury to just live, which is a lot like life too :). We sat down to draw out a plan of what the cookie stand would look like. The picture included a table, chairs, sign, and three balloons. 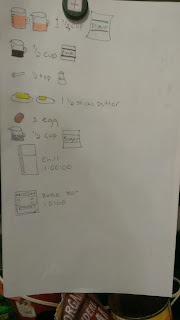 I found easy recipes for pumpkin cookies and chocolate cut out cookies, and drew them out in pictures so that they could "read" them. Feel free to use this and modify. I sent out an email to the neighborhood email list letting them know that we'd be outside on Friday afternoon: Please drive slow and stop for a homemade cookie. Marketing part 1 accomplished. Plus we had a deadline, no turning back, now we really needed to make the cookie stand happen. We talked about pricing and made a big sign to put out front of the stand. 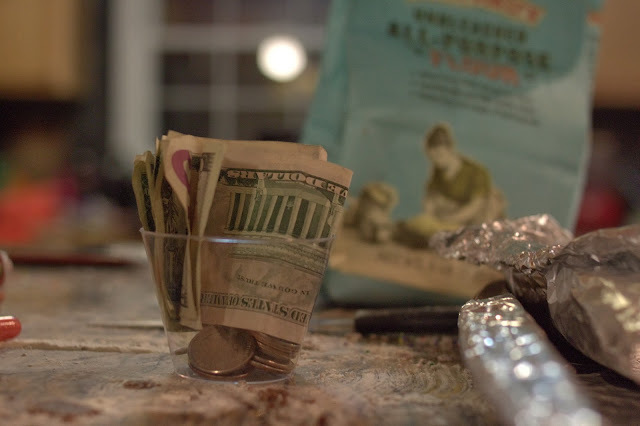 We went through the kitchen and made a list of what ingredients we lacked, including balloons, dixie cups (for milk), napkins, and little to-go baggies. Only Nala could read it. 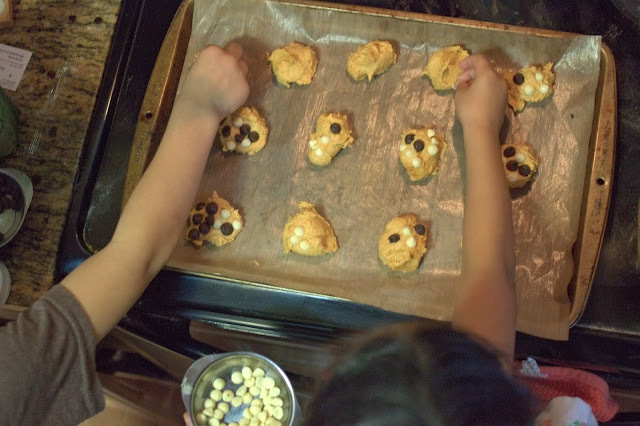 The night before, Nala and I cooked the pumpkin cookies. 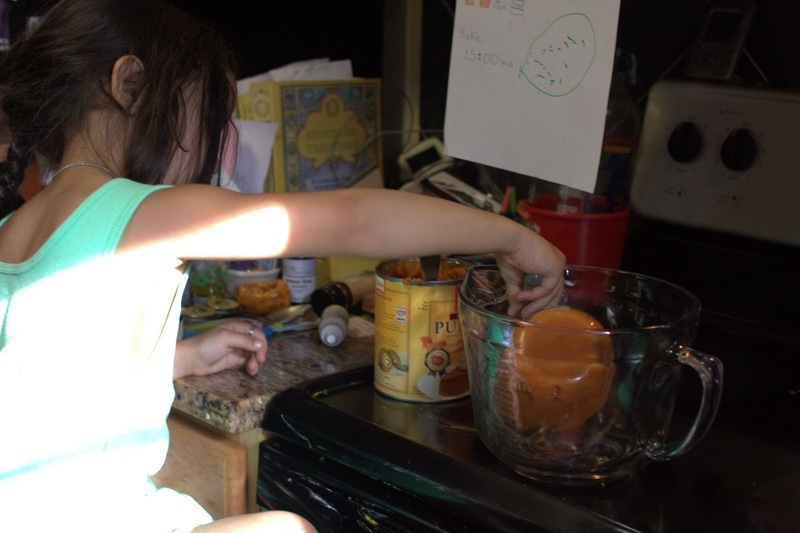 She followed the recipe by herself, with just a bit of guidance from me. 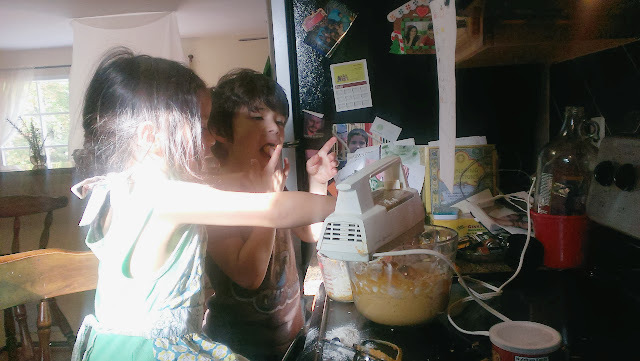 Kaio came over at the end to help with the mixing, tasting and decorating. I stayed out of the creative process and let them control the decorating. Pretty much the only thing I did was scoop the dough onto the sheet. They talked about patterns even though I couldn't understand the pattern. Each cookie seemed to represent yin and yang. 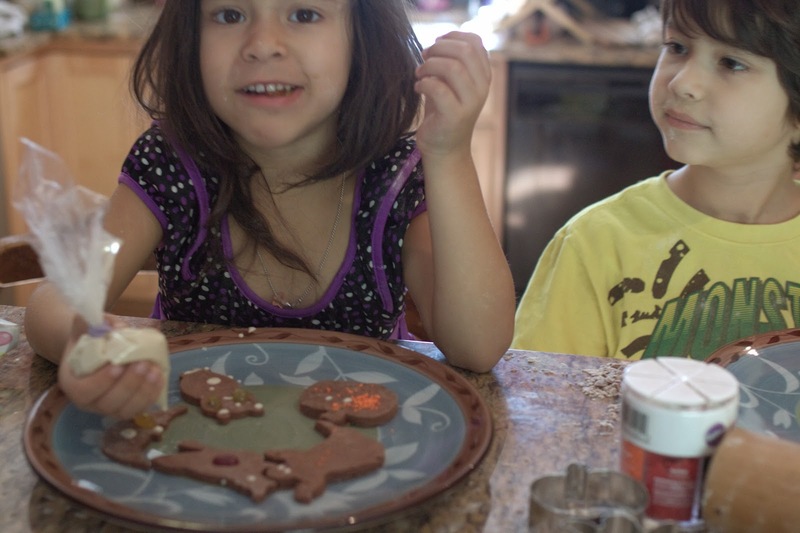 The next day while Nala was at preschool, Kaio made the dough for the cut-out cookies. 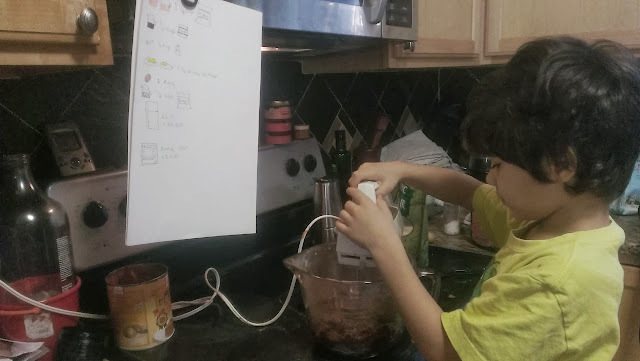 This time he followed the recipe by himself, and I just gave affirmation. 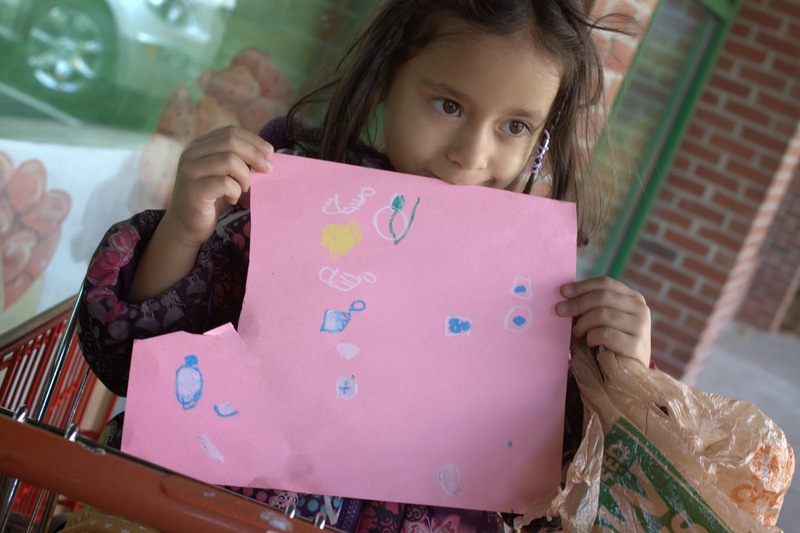 We picked up Nala from preschool, bought the balloons, and went home to decorate the cut outs. The kids did whatever design they wanted, but I did suggest that they make the cookies look appetizing so people would want to buy them. We ended up finishing everything way early, and got our booth in front of the house and hour before the target of school bus drop off. That made for a very slow first hour. I found myself secretly cursing every car that drove by without stopping. The kids were getting bummed out. It was cold, and as cars drove by and by, I was beginning to feel kind of silly. The highschoolers got off the bus and walked by with diverted gazes. After they went by, I suggested that the kids smile a little more when people pass, since smiles are helpful to make people feel welcome. - BAM. a valuable lesson in public relations. 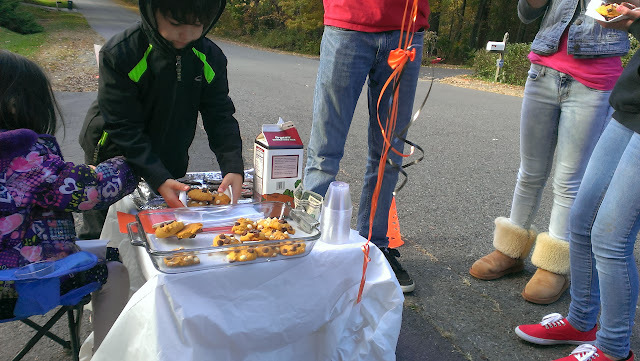 Kaio turned to me and suggested that we start giving the cookies away for free to kids and just charge adults. Such a sweet notion; he'd rather give the product away and make people feel happy, than sit on excess stock. It also sounded like a good way to get things moving. About 10 minutes later some of the neighborhood highschoolers doubled back to get some cookies. Kaio said they could have them for free, but they had money in hand and insisted on paying. They each bought at least two! The kids became so excited to be serving big kids and this offered a major boost of encouragement. 1. Ask them what kind of cookie the want (pumpkin or chocolate?) and how many of each kind?! Being an adult you forget how hard these tasks are to do! So much self control on my part not to step in and just speed it up. But the customers waited so patiently, understanding that it might take 10 tries to grab that cookie with the tong. They talked the kids through the number and type of cookie they wanted, and the kids helped each other out to get the order right. The first cookie that Kaio handed to the boy slipped off the napkin and fell on the pavement. That's how life goes though, I've screwed up so many of my first tries at something! Once the Elementary School bus let out, customers flocked. 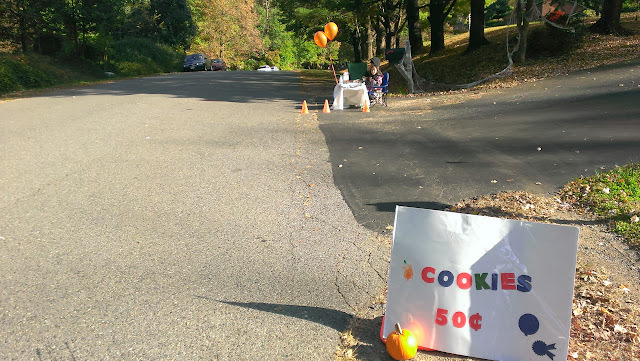 People came back for seconds and we ended up selling out of all 40 cookies. We even had to turn some late arrivers away. The learning was phenomenal. 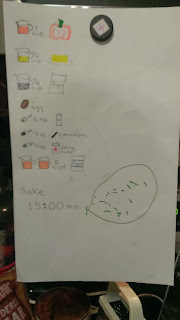 In just an hour the kids had mastered the process. When a new customer would come, they asked what kind of cookie and how many. One of them would take the money and the other would start serving. They knew to grab them with the tongs, place them on a napkin, and hand them off without dropping. If there were lots of cookies, they would serve them in a bag. Even on this cold fall day, kids were playing outside in joyous air. No one ended up buying milk. Two lessons learned: 1. Offer hot chocolate instead of milk on cold days 2. Make more cookies! 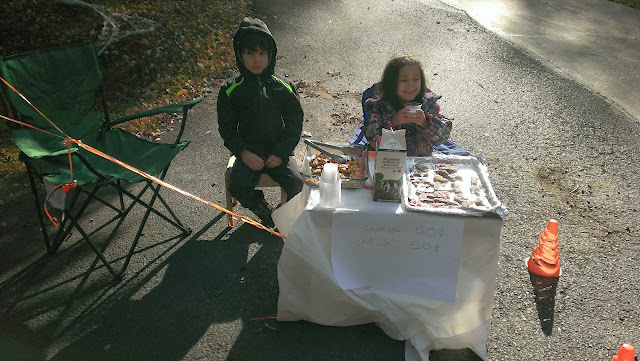 They kids made $17. They would have made more if they hadn't eaten so much of the product. But that's another lesson right? They decided to divide the money in a way that didn't seem fair to me, but made total sense to them. Kaio would get all the bills and Nala would get the change. 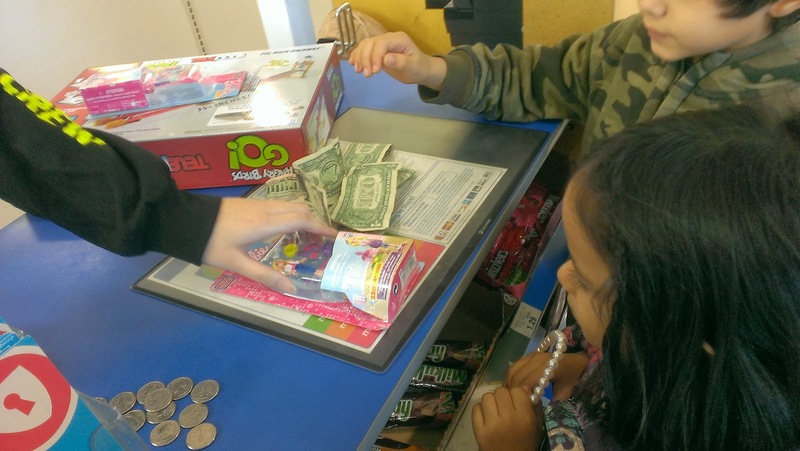 This added up to around $14 for Kaio and $3 for Nala. They were so excited! I mean beyond any other level of excitement I've seen! Jumping around the house, talking talking talking about what happened. Literally bouncing off the walls with happiness. 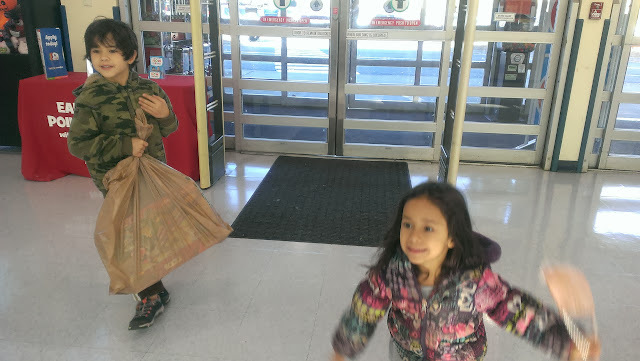 The next day we drove to Toys R Us to spend the money. Mari and I decided to match their contribution in order to help them get the toy they wanted. Just a little bit of deliberation, but Kaio ended up getting an Angry Bird Go Hotwheels Track. Nala got a Lego Barbie toy. We could have made them stick within the amount of money they'd taken in. We could have deducted for the supplies (like balloons and cups). But I think those will be lessons down the line. As a yoga teacher I know that learning takes gradual exploration. We introduce new steps safely and gently so as not to overwhelm. The kids got a taste of what it means to be an entrepreneur. What it means to create a product for the world and put yourself out there. What it means to merge joy with business and translate ideas to further to attain your passions in life. They learned about planning and execution, about reaching out to your network for support, and about the life cycle of a vision to cash. When I shared the pics with Mari, he said he teared up with pride. He shared the picks with friends and got a kick out of our lack of a business permit for the operation. It amazes me that sometimes police actually shut down lemonade stands! Kids should be allowed to earn money if they want to. It was such a great experience for us.